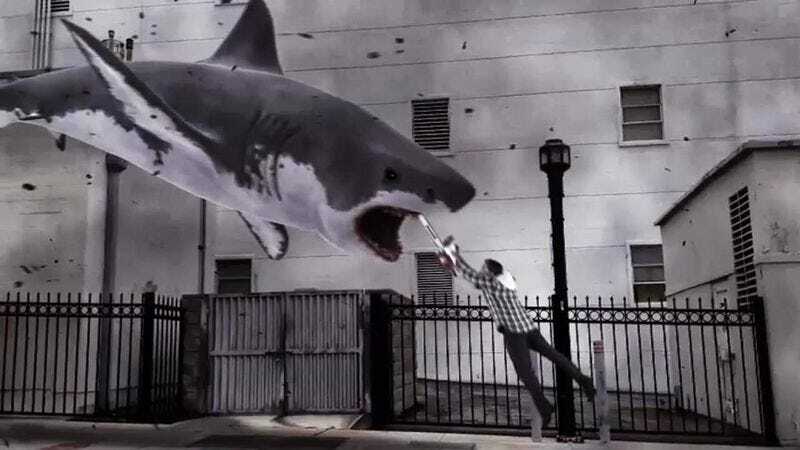 Sharknado, the deadly meteorological/zoological phenomenon that captured America’s heart in 2013, then not so much in 2014, will be bringing its increasingly rote brand of shark-and-fast-wind mayhem to multiple cities for its third outing next year. Sharknado 3—winking, ironic subtitle still to be announced—will menace much of “the Feast Coast,” from a Syfy-budget version of Washington, D.C., to an ersatz take on Orlando, Florida, all in a national epidemic of writhing, spinning, teeth-filled things we’ve seen before. The wider range of sharknadoes in the upcoming movie brings up a number of troubling questions. Has climate change caused an increase in sharknado phenomena? Are the sharks involved endangered? Are the wind currents? Will a shark be impaled on the Washington Monument—and if not, why? What third-rate star will Syfy get to play the president, and will that person get to say the phrase, “This is a national sharkmergency”? Answers to these burning questions must remain, for now, as elusive as a shark upon the wind. Sharknado 3 is scheduled to premiere next summer.